We are a family run business based in Sussex. 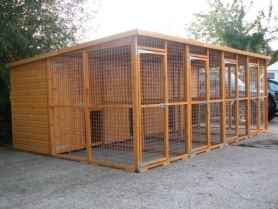 Manufacturers of dog kennels and runs, double dog kennel and run, catteries, cat enclosures, rabbit hutches and multi bay Kennel blocks since 2004. All of our wooden dog kennels are handmade from quality Tanalised timber and also dip treated. We pride ourselves in providing a professional service to every customer. Our customers include the police force, army, fire brigade, prison service, security companies and the general public. To purchase any item, simply order online and purchase using the secure PayPal payment processor or call us on 01797 229444. 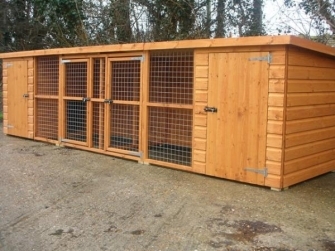 To keep delivery costs down, kennels are delivered by courier and come flat pack with fixings and assembly instructions. We deliver to all parts of England, Wales, Scotland, Ireland and many parts of Europe including France, Spain, Italy and Germany . Call 01797 229444 for a quote. 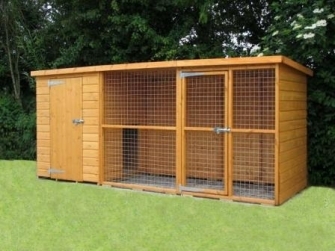 Our Wilton Double dog kennel and run, from £529 including delivery. Insulated dog kennel and run.